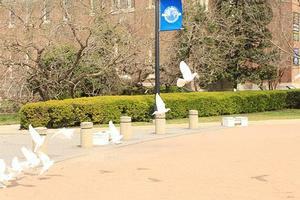 40 doves were released at the end of the celebration in honor of Dr. Harvey's 40 years of visionary leadership. HAMPTON, Va. (April 1, 2018) — Hampton University President Dr. William R. Harvey and Dr. Michael A. Battle, a former U.S. 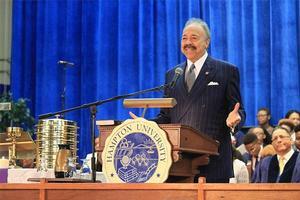 Ambassador to the African Union, gave fitting and memorable tributes to both Hampton University and its founder, Brig. Gen. Samuel Chapman Armstrong, during the Founding Day celebration at historic Ogden Hall. 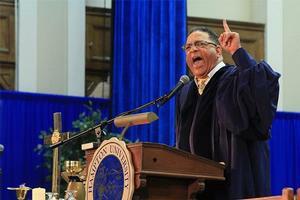 The special Easter Sunday service was part of Hampton University’s twin anniversary celebration which commemorates the university’s 150th anniversary and 40 years of visionary leadership under Dr. Harvey. Dr. Harvey spoke to Gen. Armstrong’s belief in good character and how Gen. Armstrong would want those at HU to carry themselves. Dr. Harvey also spoke to how Hampton University has continued to thrive despite naysayers and critics over its 150-year history. “On this Founding Day 2018, I want you to know that we are here today because of General Samuel Chapman Armstrong,” Dr. Harvey said. “I have read where there were two things he wanted people associated with his institution to possess: They are strong academics and good character. Of the two, he thought character was more important. These things were not only important in 1868, but in 2018 they may be even more important. I want Hampton University faculty staff, students and alumni to emulate General Armstrong’s wishes and demonstrate honesty, integrity, responsible behavior and trust in their personal and professional lives. Dr. Battle, executive vice president/provost at the National Underground Railroad Freedom Center in Cincinnati, Ohio, and a former Hampton University chaplain of 20 years, delivered a powerful sermon recognizing and tying together the three important events coinciding on the historic day. Sunday’s service also featured Emmy Award-winning gospel musician Earnest Pugh performing with the Hampton University choirs. 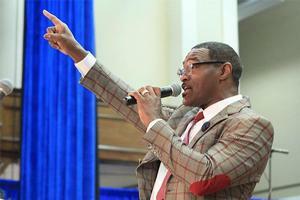 Pugh led the choirs and congregation through multiple songs that had the near capacity crowd on their feet from beginning to end, clapping and singing. The celebration was capped off by the Hampton University Student Government Association (SGA) releasing 40 doves outside Ogden Hall. University SGA President Martha Baye said the symbolism behind the doves was to recognize and honor 40 years of visionary leadership and service from Dr. Harvey.